NEW IN 2014!! We are excited to announce that we are adding a 5K fun run/walk prior to the softball game. 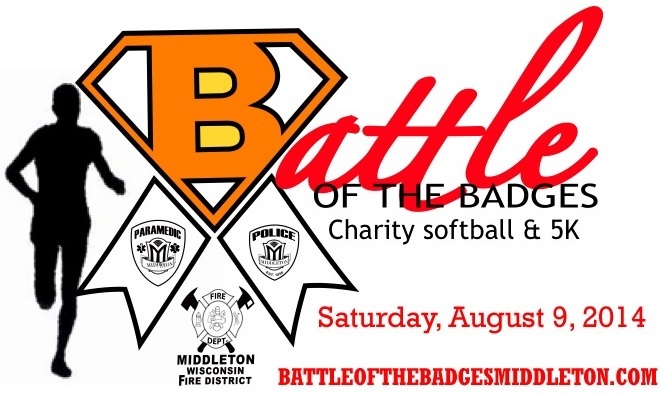 Join your Hometown Heroes from Middleton Police, Middleton Fire District & Middleton Emergency Medical Services in a fun softball game to honor 4-year Blake Rickert, who was recently diagnosed with cancer. Games, fun & prizes! Concession stand food and beverages! Money raised by both events will go to Blake and other local families affected by childhood cancer. Meet four-year old Blake Rickert. 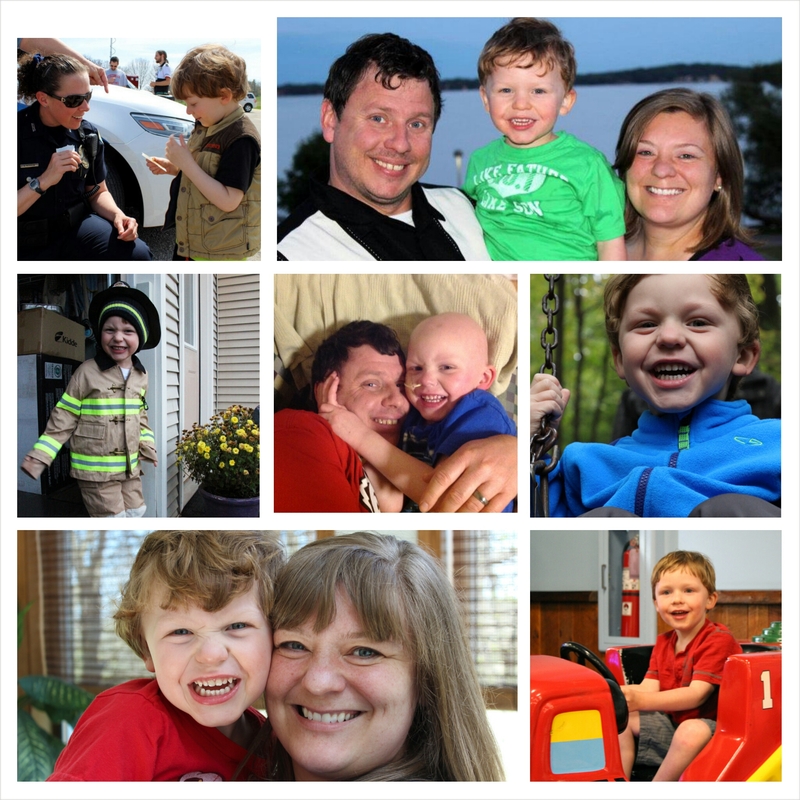 Blake is a beautiful young boy who was diagnosed with Burkitt Leukemia in January 2014. Doctors are treating his disease with an aggressive treatment protocol at American Family Children's Hospital. Since initial diagnosis, he has been hospitalized more than he’s been home. We will be honoring Blake at the 3rd Annual Battle of the Badges charity softball game between Police Officers, Fire Fighters & Paramedics from the City of Middleton on Saturday, August 9th. Blake lives in Fitchburg with his parents, Jill and Kevin. Blake is an active and inquisitive little boy who loves diggers, plow trucks, vacuum cleaners, fire trucks, police cars, cooking, shoveling, raking, gardening and playing outside. He is a sweet, loving child who smiles and laughs a lot, even from his hospital bed. The Rickerts’ are a close, loving family who never imagined that their little boy would have to deal with cancer. Blake was initially diagnosed with influenza and then pneumonia. Struck with the realization that Blake was not getting any better, Kevin and Jill took Blake to the UW Children’s Hospital, where an ultrasound discovered fluid outside of is stomach wall. Additionally, CT scans and a bone marrow biopsy revealed tumors in Blake’s stomach and leukemic cells in his bone marrow. It was determined that Blake had Burkitt’s Leukemia, it was already very serious as Blake had fluid making it difficult for him to breath and action needed to be taken right away as he was a very sick little guy. Burkitt’s is a very rapidly growing cancer; it can double in size every 14 hours. Although it is rare, patients have a great survival rate as this rapidly aggressive cancer responds well to chemotherapy. Jill and Kevin are very thankful to have the wonderful Oncology staff and nurses at the UW Children's Hospital taking care of Blake. Connect with Middleton Police on Facebook, Twitter and YouTube. You can now call OR text Middleton Police at 608-824-7300 for non-emergencies or general questions. Police on Facebook [http://www.facebook.com/MiddletonPD] , Twitter [http://www.twitter.com/MiddletonPD] and YouTube [http://www.youtube.com/MiddletonPD] . Middleton Police at 608-824-7300 for non-emergencies or general questions. the City of Middleton 2014 Citizen Satisfaction Survey!